The Northwest Passage is blocked by very thick ice in the Beaufort Sea. And cold temperatures are forecast there through the end of the month. By the time this cold spell ends, the sun will be past its peak elevation in the Northern Hemisphere and will be sliding back towards the long Arctic winter. The big lie doesn’t depend on facts however. All it requires is useful idiots in the press corps. The Arctic alasrmists that troll this site seem to have gone into hiding. Don’t worry, they come out with the summer melt. The climate alarmists “encountered unprecedented” or “unusually thick” ice… in their own words. Griff – there is your big chance …. you could be one of those useful idiots Tony was talking about … you have all the necessary qualities & have enough idiocy for at least two people … perhaps even three! Look at the data Stewart. Look hard at the data. Look at the photo Ms Griff. Look hard at the photo. You are weird, to say the least. 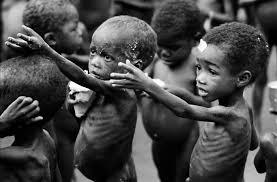 Once again Ms Griff, that photo is of the people that CAGW alarmists starve at the rate of 21,000 per day. I have shown you this time and again, along with the backing of Nobel Laureates who also say you are aiding in genocide. You are a life denier, Ms Griff. Look at the ice Griff. Look at the ice. I think he’s refering to real ice. Look hard at the data, Griff (see bottom of attachment above). Arctic sea ice is currently normal for the last 10 years. No death spiral, no sign of catastrophic warming, no need for world communism or draconian wealth redistribution. All the past crackpot forecasts of an ice free Arctic have been woefully inaccurate. Ah, so compaction means thick ice doesn’t count but when storms and winds blew ice into the Atlantic that was ‘climate catastrophe’? Got it. we don’t want to know you bowel problems, griff. We already KNOW you are full of S**T !! How do you think I gets thick in the Arctic? Without compaction, what is the maximum thickness the ice can become on an open ocean? Do you believe that the ice in the arctic is what is left of the last glacial period…….as most ignorant alarmist believe? I think you probably get pretty thick in the arctic. You’re pretty thick all the time. The myth about Arctic water gaining energy when icecap disappear due to albedo and sunshine is hard to believe. Ms Griff hates poor brown people, so she posts anything that she believes excuses her genocide. Griff links to notorious Wadhams and his failed ice vanish predictions. He now thinks this year or in 2018,there will be no Summer ice. You are being conned Griff. Yep. I thought quoting Wadhams would be specially irritiating (as he’s going to be proved right at some point). He’s only been studying the ice for 40 years or so. Ptolemy studied the heavens for decades too. His model placed the Earth at the center of the universe. The Ptolemaic Model was accepted, “consensus” science for 1500 years. That doesn’t mean Ptolemy was right. A man studying ice for 40 years (or even 400 years) and thinking that he understands the processes and patterns with certainty is like a mayfly, born at noon, studying the sun. Imagine the mayfly declares that the sun, based on his observations, is slowly dying and falling from the sky. Despite the considerable portion of his life spent on observations, the mayfly doesn’t understand the process. Furthermore, the mayfly then pronounces that the predicted extinction of all life on Earth is caused by the sinful excesses of his randy species and that oncoming extinction event can only be averted by the mayflies changing their lifestyles. Despite what the mayfly thinks, or how his society changes based on his dire predictions, the sun is going to set that night and rise the next day. The mayfly’s prediction of the sun’s setting may have correct, but that didn’t mean that he understood the process and that tomorrow the same process would repeat itself, ad-infinitum. You mean that guy that has been wrong year after year after year? The guy that claimed that three “climate scientists” he knew were assassinated by “oil lobby workers”? Your apparently as sick as he is. If I had such a dismal track record, I would change my profession. This is like the idiot hitting his head against the brick wall thinking he can get through that way and saying “I’m going to be proved right at some point!”. Well then maybe that is the problem. He, like you, only watches contemporary ice fluctuations and has no clue what is really going on up there. Wadhams is just another denier of nature, and hater of poor brown people. He has been wrong for years now! “Of course, this was not the first time you made a fool of yourself, was it? At various times in the last few years, you have issued many predictions of ice free Arctics by 2013, and then 2015. Wadhams is a crappy scientist, since there are many published science papers saying little to NO Summer ice in the Arctic as recently as the the MWP. Which is only 1,000 years ago,NOT 100,000 years ago as lunatic incompetent Wadhams thinks. “Wadhams is of course notorious for his failed predictions of Arctic ice disappearance. In the Telegraph in 2011 Wadhams declared that “It is really showing the fall-off in ice volume is so fast that it is going to bring us to zero very quickly. 2015 is a very serious prediction and I think I am pretty much persuaded that that’s when it will happen.” This was unchallenged by the journalist, showing that unquestioning promotion of climate hype crosses the political spectrum in the media. His current prediction is THIS YEAR of no Summer ice. You want to stick with this idiot? Give it up Griff, he is a warmist loon. And all he seems to have attained is brain freeze. He is THAT MUCH OF A JOKE!!! (as he’s going to be proved right at some point). It is enough with this season to prove him wrong. What a waste of a life. 40 years of failure. Whilst we are lucky to be living in the inter-glacial of the Holocene, it would be wrong to lose sight of the fact that the planet is presently in the midst of an ice age. No doubt Wadhams eventually will be proved right in the sense that the Arctic will become ice free, when the present ice age comes to an end, or if and when there is another inter-glacial in the present ice age. This will not be in his life time. Tommy, being conned presumes innocent stupidity but the evidence here points to cynical complicity. Not that I argue against underlying stupidity. About two years ago, Kato began investigating whether, as climate scientists have long anticipated, the retreat of highly reflective snow and ice in the Arctic has already produced a measurable drop in the amount of sunlight the region reflects. “If the sea ice shrinks,” says Kato, “intuitively we would think that more water is exposed to the atmosphere, and so more water vapor is available to the atmosphere to form clouds. So in addition to changing sea ice, we can kind of guess that something must be happening in the atmosphere over the Arctic, too.” Clouds are bright, too, and an increase in clouds could cancel out the impact of melting snow and ice on polar albedo. Whilst this study is in the preliminary stage, it appears that the albedo change brought about be reduced ice in the Arctic may well be offset by more clouds in the Arctic. Another one of many negative feedback loops at work, which negative feedback loops keep this planet’s climate stable within narrow bounds. Why would Ms Griff be interested in this? It does not back her religious beliefs, and it does not endorse taking resources away from the starving. Ms Griff only likes alarmist propaganda, and she hates poor brown people. In fact it looks like the entrance to the northern route has more chance of opening up this year. Oh look… griff is now putting apt titles on his posts. Yes griff, we KNOW that everything your write is COMPLETE NONSENSE. Arctic sea is levels are WAY above the Holocene average. 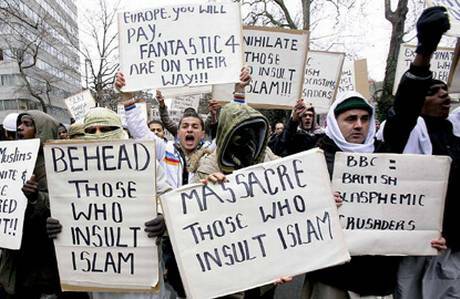 In FACT they are above what they have been for some 90-95% of the last 10,000 years. They used to fiosh, they use to travel and conduct commerce up there during the Medieval Warm Period. Not possible now except for a very small period each year. These EXTREME Arctic sea ice level they have experienced for the last 40 or so years , after the promise of more open sea, has been devastating for those trying to live up there. But you DON’T CARE about people and them trying to live, do you griff , you slimy anti-human slug. Off you slither, little slug. Leave your fossil fuel heated inner city leftist ghetto basement, and go and sail the NW Passage, like Larsen did in 1944, and Amundsen did in 1903. And no satellite help to guide you. I dare you to actually put your yapping mouth somewhere other than around your foot. 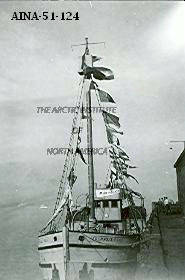 Amundsen in his strengthened boat took 2 seasons. Now a cruise liner can sail through, or a standard yacht, with no need to use an icebreaker and find a completely ice free route. I wonder that you cannot see there is a major difference? 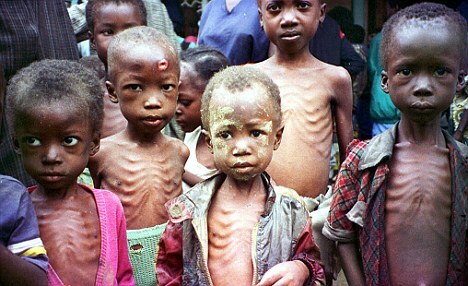 You have food, these children do not. I wonder that you cannot see there is a major difference? Griff and were you watching last year when the Crystal Serenity had to take the southern passage and avoid the blocked McClure Strait and the little dinky boat barely made it through. All aided by modern satellite info and forecasting and u are comparing to those that went by feel and fortune on their way through the northwest passage …. unbelievable. Don’t forget the St Roch that did the northwest passage also. I watched the photos posted online from that socking great cruise liner which did the passage last year, showing ice free water in front of it every day. That ice free passage did not happen in the 20th century – certainly not for 5 year plus successive periods. Ms Griff, you are exposing your leftist mental disorder. If you really care about human suffering, you will admit that spending money on a natural process that is not killing anyone goes against saving the lives about which you claim to care. Griff shocked that ice melts in the summer with 24 hours a day of sun… too stupid for words. Summer has always happened in the arctic, even during ice ages and it is proof of exactly nothing you moron! That is pure BS, Griff. Larsen had no accompaniment whatsoever. Yep. It was an out and out lie. What?! A genocidal leftist that lies? How long has this been going on? Tsk, tsk. And here I thought at least he got his facts straight. That’s very interesting – how to win arguments by pulling points out of thin air … For people of a certain ilk it seems to be part of their MO (or should I say DNA?). griff exists on OUT and OUT LIES. NO-ONE has followed the route Larsen took ever since , because it has not been possible. YOU ARE A SLIMY LYING SLUG. BTW just think about the history. WW II was still going on. There were massive convoys taking war materials to the northern ports of Russia and sparing a precious ice breaker for a polar expedition at that time would have been pure insanity. BTW the Wind class, the largest class of icebreakers used during the war and afterwards, didn’t start coming into service until 1944. Whatever you do, rw, don’t go to Canada. You have violated Ms Griff’s “gender expression”. The NorthAbout was certainly not a standard yacht. Its hull was probably stronger and better designed for the task than Amundsen’s. It also had about 5 times the speed under motor, which they used to good effect as used satellite and drone navigation to find their way though the rapidly closing sea ice. Even so, they had to sneak round basically the most southerly route, avoiding those take by Amundsen and Larsen in 1903 and 1944. You really do have to try to get at least one fact correct once in your PATHETIC life, griff. !! You really are showing your ABSOLUTE IGNORANCE, as always. Northabout is a purpose-built polar exploration sailing yacht. She has already sailed both the Northeast and Northwest passages of the Arctic Ocean in different seasons. 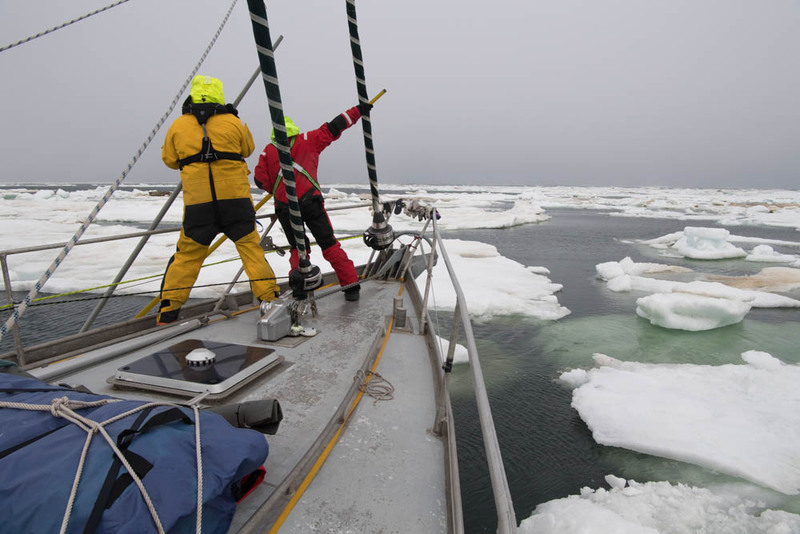 Last summer, to prepare for such a treacherous journey, Northabout sailed to the Svalbard Archipelago to see how both the yacht and crew coped with Arctic conditions and to prepare for the challenge ahead. How is Northabout specially designed for polar expeditions? * The boat is made from aluminium and has been reinforced so it can break through the ice. The bottom of the boat is especially strong. * The front of the boat (called the “bow”) has been shaped so it can ride up on the ice and break through it. * The propeller is protected in case it hits ice. * There is a retractable keel meaning that the yacht can have a more shallow draw and therefore get into some areas that could otherwise be inaccessible. * Navigation equipment such as radar, cameras, a drone, charts and depth sounders. * Safety equipment including an 8-person life raft which will be strapped to the top of the boat, and a satellite phone so the boat can contact the coastguard if they get into trouble. So , it seems you are just going to keep up your meaningless LIES and YAPPING. YAP as much as you like from your fossil fuelled inner city ghetto basement. Too much of a COIWARD to leave your cosy warm slime-ridden den and actually put your money where your yapping comes from. Power source: 150 hp Union diesel, 6 cylinder; schooner rigged. Go away Griff, you are making a fool of yourself. BTW Griff, the 1944 journey only took 89 days. A basic video from 1988 showing the warming over Arctic as a result of thinner ice. The question is will water cool or warm as ice disappears? Hint: More heat goes up to the air from the water. “So what are these feedbacks, and how do they interact? The most basic stem from turning the Arctic Ocean from white to blue, which changes the region’s albedo — the amount of solar radiation reflected off a surface. 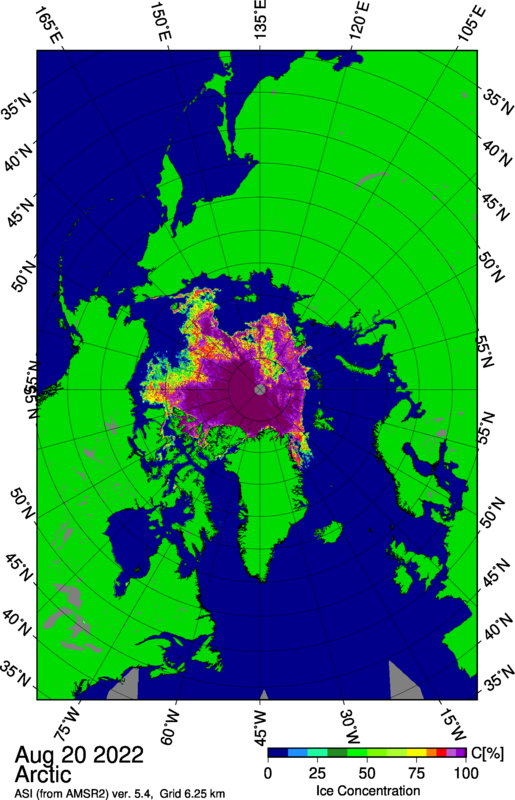 Sea ice, in summer, reflects roughly 50 percent of incoming radiation back into space. Its replacement with open water — which reflects roughly 10 percent of incoming solar radiation — is causing a high albedo-driven warming across the Arctic. But she love’s these people. Guess who else loves ice more than human life? The sun has an angle, a tilt that increase when icecap is at its low. The black sky has none as summer sun disappears. This year is a good example! If a portion of what has been spent on mythical human caused climate change had instead been spent on the eradication of the vector and prevention and treatment of Malaria and other mosquito borne diseases such as dengue, West Nile virus, chikungunya, yellow fever, filariasis, Japanese encephalitis, Saint Louis encephalitis, Western equine encephalitis, Eastern equine encephalitis, Venezuelan equine encephalitis, La Crosse encephalitis and Zika fever, mortality would be a tiny fraction of the 1 million that currently die from those diseases annually. Griff of course doesn’t care, even though I have pointed that out before. Tru RAH, except I’ve been explained that killing these people off is not a bug but rather a feature of the environmentalist human stock management program. But I can care about that AND climate change. Only if you like fake science. Let us deal with reality here. Besides. Anyone that knows anything about it understands that precip levels and available moisture have more to do with it than a degree or two C change in temperature does. You only care about showing your ignorance as a base level troll. Yes, Ms Griff, we understand you care about the frightening growth of this enormous horde of brown people, a plague on the Earth. Griff what are you talking about “tens of thousands of years”? There is significant evidence this happens frequently. Look at newspaper reports from the 1930s and 40s. Look at archeological evidence from Greenland. Look at the evidence for many thousands of years from beachfronts, sediments and erosion. You sound like a scientific denier. If you look at the collected evidence for the 30s and 40s you will find that the lowest 20th century sea ice extent was GREATER than the lowest values seen since 2007. Even if true, so what? We are in an interglacial, and ice at the poles should be melting as a result. The longer the interglacial lasts, the less ice in the Arctic, and nobody dies. and has nothing to do with global warming? You must be talking about 2012 – fair enough, but I doubt that that’s as devastating a fact as you seem to think. After all, we’re 5 years out from that date, and the minimum extent hasn’t been close to that since. You are an ignorant moron, griff. These levels are still VERY HIGH compared to the Holocene history. The ONLY time they have been higher was during the Little Ice Age. The late 1970’s was a peak up there with those EXTREMES. Current level is still way above what it has been for some 90-95% of the last 10,000 years. The Northwest Passage Project. There’s at least one every year, sooner or later they’ll come a cropper. Now all we need is another Polar Challenge. And some hearties willing to try again to row their way through the Passage. I am wondering if the eastern approach to Cambridge bay will open this year, with all of the ice around King William Island. How many times is this sequence of comments going to be repeated? Why not read something new — from the 1970s. Historical Aspects of the Northern Canadian Treeline by Harvey Nichols. What about this? Baffin Island 1978.